It wasn’t for the fun of it. It was to relieve the chronic pain without the risk of long-term damage. Specifically, he notes how common it was to see other players down five to 10 ibuprofens prior to practice every single day. Over the course of a few years, he says, that could do severe damage to one’s liver. For him, marijuana was his medicine. In fact, he was one of the 103,000 people in Colorado with a medical marijuana license who was legally allowed to grow the plant. The only risk, he says, was that he might get caught by his coaches, be sanctioned by the NCAA and lose his scholarship. Ultimately, that’s what it came to when he feared he may not be able to hide it any longer. He quit the team. Recently, he spoke to USA Today, urging the NCAA and other sports organizations to reconsider their hard line stance on the drug, which is legal as medicine in 25 states – including Colorado. Other athletes are beginning to speak up on this issue as well. For example, former Baltimore Ravens offensive tackle Eugene Monroe, Tennessee Titans linebacker Derrick Morgan and Chicago bears quarterback Jim McMahon – all are asking the National Football League (NFL) to conduct more research on the drug, and consider it as an option for players coping with chronic pain. NFL Commissioner Roger Goodell said the league does review its drug policies periodically, but he doesn’t foresee any changes in it for the near future. But this issue is not likely going to go away, particularly when you consider the ineffective ways universities are dealing with chronic pain among athletes. For example, in a recent three-year time frame, Colorado State University doctors prescribed more than 19,000 over-the-counter painkillers for its 400 student athletes. Meanwhile, the University of Colorado prescribed some 37,000 pills for its 350 athlete students. A head trainer at Colorado State also said about five dozen Vicodin had been ordered during that time too, though those were filled at local pharmacies. Jarrells confessed he lied to his former coach about the reason he needed to leave the team. He told him it was a personal issue; he’d signed up to work with the previous coach, and his relationship with the new one wasn’t working. Further, he said, his godfather was gunned down over the summer and his classwork was suffering. He needed to step back. His coach allowed him to continue his junior semester while receiving his football scholarship, even though he wasn’t playing. He now says if he’d told his coach the truth, he never would have been able to finish out the year with his scholarship. His goal, he said, was to avoid getting drug-tested long enough to get his degree. 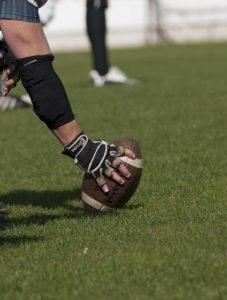 He hopes in the future, other football players won’t be forced to go down that same road and will be allowed to play while still consuming the medical marijuana that relieves their chronic pain from the game.